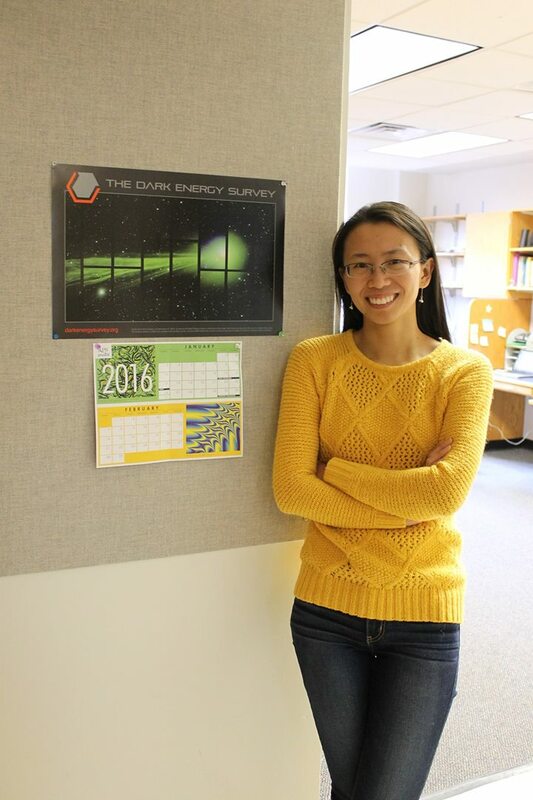 Yuanyuan’s main interest is to understand the galaxies inside galaxy clusters. Galaxy clusters contain more than just galaxies, like plasma (hot gas) and dark matter. The galaxies are what we observe with DES and she studies what galaxy clusters look like to DES. The career goal went through several phases of development. I was really good with physics in high school, so I considered the possibility of doing physics or mathematics for a living. Then in college, I realized that physics research is very different from classroom learning, but I loved the way physicists think about problems. So I came to graduate school to receive the training. Any other fun fact you’d like to share? The primary unit of Chinese money is “Yuan”, but no, my name does not mean money. My name means “circular’’ literally and “fulfilling” symbolically. You can start from one point on a circle, make a long journey that passes all the other points, and then return to the same starting point. My parents wished me to “happily fulfill the original goals” while not being distracted by superficial successes. Being a scientist or a scientist trainee means being under much pressure and having a busy schedule from time to time. My father tries to hardwire a principle to me brother and me that “no matter what happens in life, exercise regularly, eat vegetables and get a proper amount of sleep”. I found it helpful when I have difficult tasks to deal with.